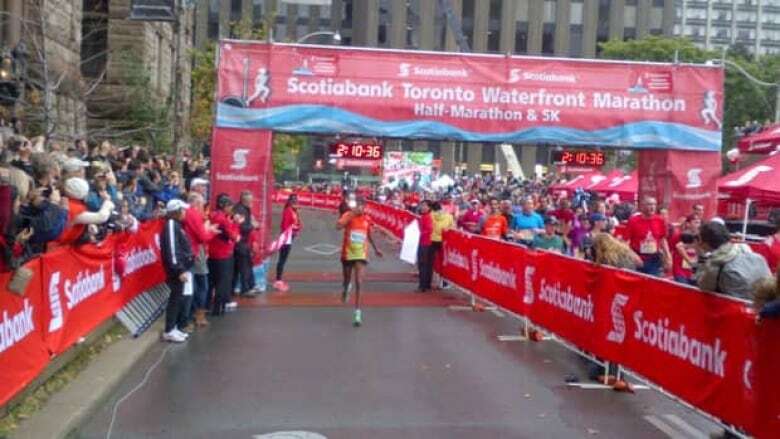 Thousands of determined runners made their way through a rainy race course on Sunday morning, as they took part in the annual Toronto Waterfront Marathon. Sahle Betona Warga of Ethiopia was the first person to cross the finish line in the full marathon. He ran the nearly 42.2-kilometre distance in a little over two hours and 10 minutes, according to early results posted online. Two other runners — Kiplimo Kimutai and John Kiprotich, both from Kenya — finished less than a minute behind Warga. Mary Davies of New Zealand ran the fastest marathon time among women participating in Sunday’s race. Some participants were running a half-marathon or a five-kilometre race on Sunday, as opposed to the full marathon. Francisco Mendez of Chile was first in the half-marathon among males and Esther Jeptum of Kenya was the top female in the same category. Jamie Switzer of Peterborough, Ont., had the top time for men in the 5K race, while Lisa Cybulskie, also of Peterborough, Ont., led the women running in the same event. Fauja Singh, 101, also ran the 5K course this year. 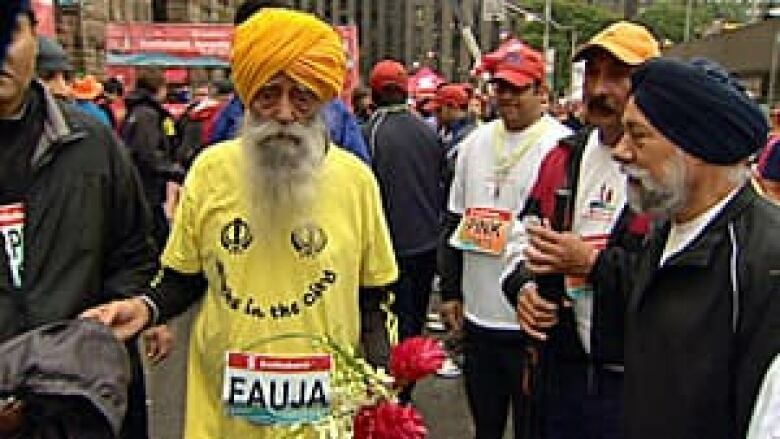 Singh, who ran the full marathon last year and set a record as the oldest person to do so, told CBC News he plans to keep running for as long as he can. Another elder runner also made his mark during Sunday’s race. Ed Whitlock, 81, of Milton, Ont., broke the record for runners in the 80-plus category. An earlier version of this story incorrectly identified the fastest male in the half-marathon as Dave Clark. According to official race results, the actual winner was Francisco Mendez of Chile.